For most of his reign thus far, warlord-in-chief Barack Obama has generally not encountered a civilian drone bombing he didn't want to authorize or a new war he didn't want to start. This past fall, however, he allowed himself to be pressured out of attacking Syria. This January, he actually appears to be actively opposing US aggression against Iran. This is truly a puzzle given his past behavior. The true motivations of the power elite are inherently unknowable to us mere mortals. They are driven by a web of personal, political, and corporate impulses which interact unseen to us. We may sometimes correctly guess what vector is pulling the strings of a particular policy, but we can nevertheless only guess. Astrology, however, suggests that among other factors a streak of ethical awareness may be temporarily affecting our normally bloodthirsty leader. Regular readers know there is one consistently attributable cause to movements toward peace: Pallas. 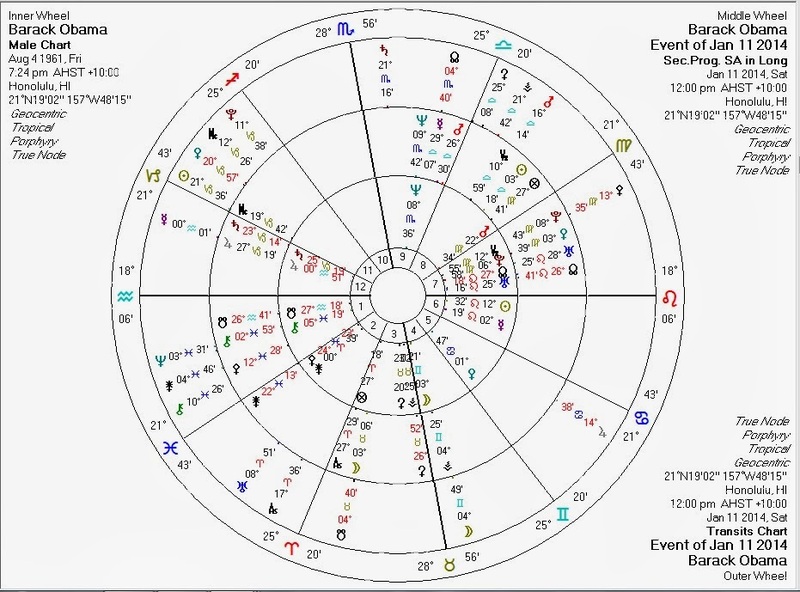 Obama's progressed Pallas has recently passed an exact quincunx with his natal Sun. Leaning even more strength is transiting Pallas, opposite this progressed Pallas. This chart is for a couple of days ago at no particular time, to show us Obama's general weather for mid-January. Peaceniks and libertarians should enjoy it while it lasts... which won't be long at all. And bear in mind that this in no way makes Obama a champion of freedom: despite this and a number of token measures against the NSA, he's still going full-bore to push through the secret job-killing Trans-Pacific Parternership.